The prison guard has caught up with Michael and Rick. Michael tries to hide his face from him. Rick explains that his girlfriend punched him (!) because he made a smart alec comment about her brother, who is in the detention centre. The guard seems to buy this, and Michael and Rick walk off hand in hand. Lauren is trying to get information about Brad out of a very exasperated Pam. Lauren explains that Brad has quit his job on the cruise ship. Pam sharply tells her that it's typical behaviour from Brad - they barely heard from him when he was travelling in the past, and he'll turn up when he chooses to. Pam and Lauren have a frosty exchange, where Pam wonders why Lauren wants to contact Brad so urgently and Lauren excuses herself. Julie and Debbie banter a little bit. Julie cheerfully complains that she never sees Debbie anymore, and Debbie tells her that she's got a busy life! Deb says she won't be in for dinner because she's got a date with Darren. Julie orders her to cancel it. JULIE: I want you home tonight. JULIE: Home. Remember home? The place you eat occasionally? Sleep, do your homework and don't pay any rent? Debbie is confused - she thought that Julie liked Darren. Julie assures her that she does but she thinks that Debbie's schoolwork is suffering. Julie tells her that she must have a weekend-only social life until her marks improve. Debbie kicks up a fuss, but Julie is insistent that Debbie cancel her date with Darren. Debbie looks annoyed. 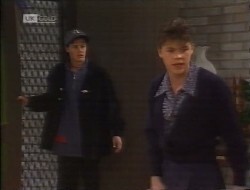 Michael and Rick are walking back to Erinsborough. 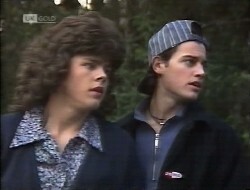 A car flies past them, and Michael blames Rick for not bringing him normal clothes to change back into - no wonder cars aren't stopping for them. Rick shoves him to one side to hitch a car. It stops and the driver agrees to give them a lift - on the condition that Rick's "sister" (Michael) sits next to him. They jump in but when the driver goes to touch Michael, he flips. DRIVER: What are you?! Perverts! He shoves them back out and drives off. MICHAEL: Can you believe that guy? He fancied me until I said something! RICK: Well, Darren Stark's about to play Bonnie and Clyde with your sister, so just don't blow it! Pam and Beth chat about Doug and his lack of work. Pam feels sorry for Beth not being able to finish her apprenticeship. Beth says that she respects Doug for the stand he took against Baker and his shonky working methods. Beth says she'll find something - and if it has to be outside the building industry, so be it. Pam tells Beth she's organising a surprise party for Helen's birthday. They wonder about having it at Number 28, but Beth warns that if they do, word will definitely get out - it needs to be held out of Ramsay Street in order for it to be kept quiet. Cheryl is standing in Lou's kitchen. Lou wonders if she's ok. She says she is, but Lou is confused - she's been there for 30 seconds and hasn't come onto him yet! Cheryl is trying to hold back from being too pushy - and then asks him to do something in the afternoon if Lou has no other plans. They agree to a bottle of bubbly, a movie and a spectacular meal at the Westminster - but Lou wants to pay for it. Cheryl thinks it sounds lovely. There's a knock at the door - and Lou wonders if it'll change their plans. Cheryl says she's going to hold him to everything he said, and he points out that she's being a tiny bit aggressive again! She apologises and he answers the door to Darren. DARREN: What are you doing here, Mum? CHERYL: Mind your own business! Darren says that he can't work for Lou this afternoon - and Lou is fine about it. He goes to get his jacket. Darren asks Cheryl where she's off to, and Cheryl says that she'll start telling Darren where she's going when he starts telling her where he goes! Darren warns Cheryl that she doesn't want to know where he's going. Cheryl asks why he can't work. Darren tells her something has come up. Cheryl is sceptical but Darren says that it's just a little surprise for Debbie. He walks off, saying it's nothing for Cheryl to worry about. Cheryl doesn't seem at all impressed. Gaby runs a search to see if they can find a function room to have Helen's party in - but they're all booked up. Gaby says it's not likely that any of the function rooms will become free as they've all got deposits on them. She suggests the Waterhole as an alternative - it's due to open this weekend anyway. Phil walks in and Gaby tells her about the idea of using the Waterhole. Phil agrees, but tells Gaby that she'll have to handle it all as he won't have time. 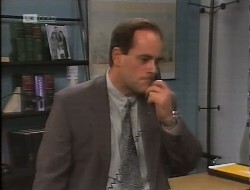 Phil walks into his office and Gaby calls after him, telling him about an issue. Phil's very subdued and says he'll deal with it later. Gaby tells him that it's important, and Phil merely replies with, "It always is." He goes into his office and slams the door. PAM: Is he all right? Darren and Debbie order. Darren tries to convince Debbie to get a huge plate of food like him, but she sticks with an orange juice. They sit down and he quizzes her. Debbie confesses that she's not allowed out anymore and that Julie's come down on her like a tonne of bricks. Darren starts giving Debbie an ample dose of attitude - he tells her to come with him anyway. Debbie tells him that Julie will make her life hell if she doesn't do what she's told. Darren tells her that he'll call Louise instead. Debbie tries to talk him round, but he's not having any of it. Darren lays on the guilt trip with Debbie, and makes it clear that he's interested in Louise. Debbie is upset when Darren goes on about wanting a wild woman who's up for anything, and points out that she went joyriding and pinched the stuff he wanted. In the end, she relents and agrees to go with him on their planned date. Rick and Michael are arguing about the fact they won't reach Debbie in time. Michael is having trouble walking in his shoes - they're a size too small for him. Rick says that they should've called the cops and at least they'd have got Darren. Michael isn't impressed - if they'd done that, the cops would throw Debbie in the can as well! A bus pulls up over the road and the pair sprint towards it. Cheryl and Lou are chatting. Cheryl says that Janine was the perfect daughter - nothing like Darren - and she wishes that Darren had gone into the navy as well, or something similar, as it might have kept him out of trouble. Lou says that his children are like chalk and cheese too - he and Guy used to fight like crazy. Cheryl confesses that Darren's dad was tough on him, and when he died, she was too soft as she didn't realise that he needed strong discipline and now he's uncontrollable and it's gone too far to pull him back into line. Lou comments that Darren's pulled himself around now. Cheryl thinks that Debbie's good influence has helped immensely. Lou says that Lauren's romantic scrapes are difficult, but they get on well otherwise. They pour out some drinks and toast each other. Lou says he's glad they went out for the day and Cheryl smiles. Julie arrives home, but Debbie is about to go out. They argue about what Debbie is going to do, and Debbie stands up to Julie. They have words and Debbie cracks and tells Julie that Darren will dump her if she doesn't go out. Julie can't believe it, but the look on Debbie's face verifies that it's true. JULIE: That's blatant manipulation! Don't give into it! Julie says that if Darren doesn't understand the importance of Debbie's studies, she's better off without him. Worriedly, Debbie says she doesn't want to be without him. Julie tries to get her to sit down to talk things through, but Debbie flips and storms out. Beth is scouring the job pages in the paper. Kristy suggests that Beth try her hand at modelling! Beth thanks her, but says it isn't for her. Lauren comes in and they exchange cold comments towards each other. Lauren asks if she's heard from Brad and Beth says she hasn't. Beth wonders why Lauren cares - she thought Connor and Lauren were an item now. LAUREN: I am getting so sick of everyone being judgemental about me and Connor. BETH: Well, that's because we all like Brad! Lauren tells Beth that she's trying to do the right thing and storms out. Michael hobbles into 24. Rick says they need to get a move on, but Michael says he isn't going anywhere until he has some proper clothes and shoes! He pulls his disguise off and Rick goes to Number 32 to see if Debbie has already left. Michael says that if she has, they'll grab a car and try and cut them off at the petrol station. MICHAEL: I am going to kill Stark when I get my hands on him! RICK: Not if I get to him first! Michael runs off to Rick's room to change. Julie is angrily hoovering when Rick hammers on the door. Julie tells him that Debbie's not there, and Rick wonders if Julie knows where she's gone. Julie tells him that she's out with Darren, and they left 10-15 minutes ago. Julie wants to know what's going on but Rick charges for the door. JULIE: Don't you run away from me! Is Debbie in some kind of trouble? 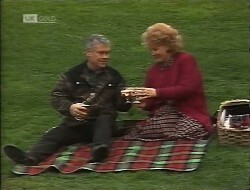 Lou and Cheryl are enjoying their afternoon together. Lou says that it must've been hard for Cheryl when her husband died. Cheryl admits that her marriage wasn't always great, although in lots of ways it was special. She says it's empty without him around. 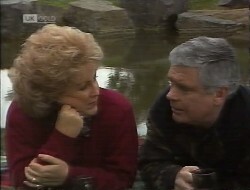 Lou asks about her re-marrying, and confesses that he's never found relationships too easy - apart from Madge, but that still had its problems. He comments that Cheryl is like Madge - caring, generous and very independent. Cheryl laughs. Lou says that his life has been empty without Madge. They decide to move somewhere a bit warmer and pack their things up. Michael is finishing getting dressed in Rick's clothes. Rick rushes in and tells him that Debbie left 15 minutes ago and he's going to call the cops. Michael dives for the phone and stops him. RICK: The guy at the petrol station's got a gun! And he's twitchy. If Darren hassles him, he might use it! MICHAEL: No cops! Look, it's not just Debbie. I've escaped from detention and you've helped me. We'll both be in for it! RICK: Yeah, and Debbie might get shot! Michael grabs Lauren's car keys. RICK: We can't take Lauren's car! MICHAEL: Well, have you got a better idea? Catch a taxi?! Walk?! Neither of them are licensed to drive, but Michael insists that they have to go. Julie is still cleaning and collects Debbie's books together. She stands for a moment and then angrily throws her pencil case to the table and drops onto the sofa. She looks gutted. A voiceover from Phil starts. PHIL: (voiceover) Of course I've thought about it. PHIL: I've done nothing but think about it for weeks now. ... Thanks, Paul but I won't change my mind. Julie is dusting the fireplace. PHIL: (voiceover) God, I know she's your sister. God, she's my wife! Julie accidentally knocks off the photo of her and Phil, and she yelps. It falls to the ground and smashes. Slowly, she picks it up and then sits on the carpet, holding it. Phil is still on the phone. 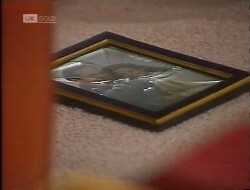 (And there's a nice echo of the photo imagery, as we can see Phil's family photo still on the shelves behind his desk.) As the conversation with Paul goes on, Phil looks more and more upset. PHIL: The bottom line is that she doesn't want me around anymore. She's made up her mind. ... Yeah. ... Yeah, it's simple. ... I still love her and it hurts too much to stay around Erinsborough. ... No. No. I have to go. As soon as possible. ... Paul, I appreciate your trying but you won't talk me about of it. ... Yeah. Listen, I've got a few important business calls to make. I've gotta go. Goodbye. 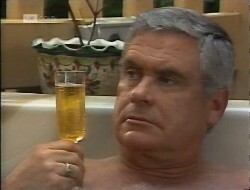 Lou and Cheryl are having a drink in the spa. Cheryl thinks it's a perfect end to a perfect day, but Lou corrects her - it's a perfect start to a perfect evening! Cheryl says she hasn't had so much fun in years, and they both seem very happy. LOU: Cheryl, the more I know you, the more I like you. CHERYL: You don't find me too aggressive anymore? LOU: Nope! Sweet and dainty! Lou says there's one thing he doesn't understand - how come some other bloke hasn't snapped her up? Cheryl thanks him, but says she's not the sort of girl who gets snapped up unless she wants to be. CHERYL: You could do it, Lou. If you had a mind to. LOU: Ah, now there's a thought. Depends what you mean though, doesn't it? LOU: By being snapped up. Cheryl takes a deep breath. The petrol station attendant serves a bloke who then leaves. Debbie and Darren are skulking by the door. Debbie is nervous as the attendant is watching them, but Darren berates her for being a wimp. He says that all they're going to do is steal some things for the movies and leave. Debbie warns him that she's not very good at it - last time she couldn't even keep the guy talking. DARREN: I'll take care of him this time. You pinch the stuff. He stalks off towards the counter. PETROL ATTENDANT: Can I help you? DARREN: Yes, you can, mate. DARREN: You can start by opening the cash register. Debbie realises what's going on and goes to join him at the counter. DARREN: Don't waste my time, mate, get it open! PETROL ATTENDANT: I need a key. DARREN: No, you don't! Get it open NOW! DEBBIE: Darren, what are you doing? DEBBIE: Darren, put it down! Debbie grabs at Darren's arm. Rick and Michael's car squeals onto the forecourt. 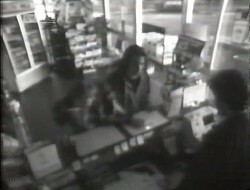 Michael jumps out of the car and spies Darren and Debbie in the petrol station. Rick tells him to be careful. He rushes over to the station as Rick parks the car up. Debbie is pulling on Darren's arm, trying to get him to put the knife down. Michael storms up to the door. Rick gets out of the car and a single gunshot rings out. Rick looks stunned.